By plane: Henri Coanda airport (Otopeni) has flights to most European capitals, as well as many places in other continents. From Bucharest you can reach the area by car or by train. Alternatively, you might be able to find a flight to Targu Mures airport. WizzAir operate out of it and have regular (but not daily) flights between Targu Mures and Luton. There are car hire services at Targu Mures airport and it takes about 60 minutes to reach Sighisoara by road. By train: Many international trains stop at Sighisoara station on their way south, coming from Vienna, Prague, Budapest. It is possible to reach Sighisoara by train from the UK if you are a more adventurous traveller but you should factor in a couple of days for it. In addition, there are usually five or six trains per day leaving Bucharest and heading north-west, all of which stop at Sighisoara. 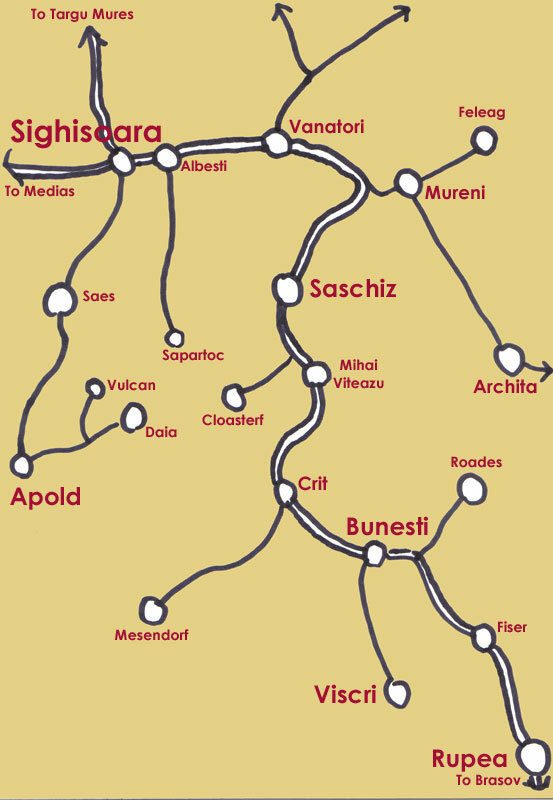 The Bucharest-Sighisoara leg takes about five hours (plus or minus depending on the type of train). Tickets cost between 15-25 Euro one-way, depending on class. By bus: There is a 'maxi-taxi' bus service from Bucharest to Sighisoara that runs about 5 times a day. It also takes between 4-5 hours depending on the traffic. The maxi-taxi is essentially a privately-owned minibus service and costs about 12 Euro one-way. The advantage is that the driver can drop you off anywhere on-route (handy for those living in Bunesti or Saschiz, for example). By car: Coming from the west by car is a lengthy process. Progress through Germany and Austria is relatively painless with the extensive autobahn network, and Hungary has improved greatly in recent years. The problems occur after crossing the Hungarian-Romanian border as the Romanian leg of the trans-European is still in construction. This means travelling largely by single- or ocassionally dual-carriageway road heavy with truck traffic during the week. From crossing the border to Sighisoara you should factor in about 4-5 hours of driving. As of writing (2012) there are several sections of the Romanian motorway completed. One goes from the Bucharest ring road to Ploiesti and the other is up in Transylvania near Cluj. Other sections are due to be complete in 2014, although realistically, it's going to be at least 5 years before anything is complete enough to make a significant difference to travelling times. The last part to be completed is likely to be the Comarnic-Brasov stretch that passed through the Carpathians as it requires many kilometres of tunnels and raised roadways.